combination of these core ingredients. 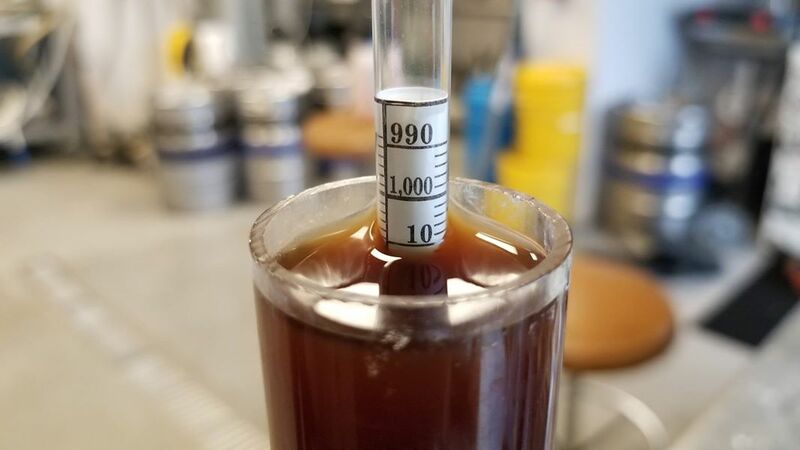 The beauty of working at a small brewery, like Newaygo Brewing Co., is that we are able to play around with these ingredients on a regular basis to see what does and doesn’t work for us. The newest experiment at Newaygo Brewing Co. is our Hop-Ed: Brut series. 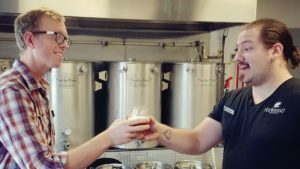 Brut IPAs are a fun, new twist on an IPA and a rebuttal to the super hazy, juicy New England IPAs (NEIPAs) that have overwhelmed the craft beer world over the last couple years. Where NEIPAs have a full, sweet mouthfeel, almost like drinking a glass of orange juice, Bruts should be crystal clear, bone dry, and highly carbonated — kind of like drinking a champagne. 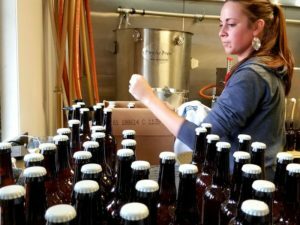 What NEIPAs and Bruts have in common, though, is a lot of hop flavor and aroma but not a ton of bitterness. 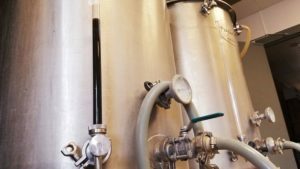 We are able to make the beer light and dry by adding an enzyme (amylase) that helps break down the wort — the term for unfermented beer — into simple sugars that the yeast can eat more easily, leaving behind less residual sugar and a lighter, drier beer. This dry, clear beer is a perfect foundation on which to experiment with a variety of hops and let you, and us, see how the differences in the hops express themselves in a beer without the flavor of the malt or yeast getting in the way. 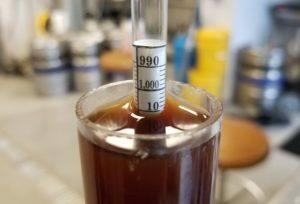 Each beer in this series will feature just one hop, all added late in the boil or in dry hopping to maximize the hop flavor and aroma without overwhelming your palate with the bitterness that IPAs are typically known for. We called this the Hop-Ed Brut series, because we hope that each time you try a new batch, it will provide an opportunity for you to learn about a new hop, or at least experience it in a new way. This last Friday we tapped our first beer in this series, featuring exclusively Mosaic hops. If you have had a chance to try this already, you will know that Mosaic hops are very fruity, with a tropical note to go along with with notes of pine that is common in hops used in IPAs. The next beer in this series will feature Simcoe hops which are actually one of the parent hops of Mosaic. Simcoe is not as fruity as Mosaic and leans heavily on earthy and piney flavors and aromas. When you smell this beer, it is not as fragrant but certainly has a piney kick that will be familiar. While I have not brewed the next beers in this series just yet, in the next few weeks I plan to brew a Hop-Ed featuring Cascade hops (Michigan grown hops with floral, citrus, and grapefruit notes), and Copper (a proprietary Michigan hop with notes of Hawaiian punch, citrus, and black pepper). Newaygo Brewing Co. is all about the community and the people who come and share beer and experiences with us. So, come and drink with us. Learn with us. We have a seat waiting for you in the front of the class.